As a parent I know what a battle it can be to get your kids to clean there teeth properly. We have had more than one stand off in my house with me and my youngest son over this very subject. I found that one of the reasons that he did not like to brush his teeth was because the cheap toothbrush I had bought him was hurting him. Luckily Philips now has as part of there Sonicare range has a electric toothbrush that has been designed perfectly for kids, but does this make the battle to get them to brush there teeth at bedtime any easier? 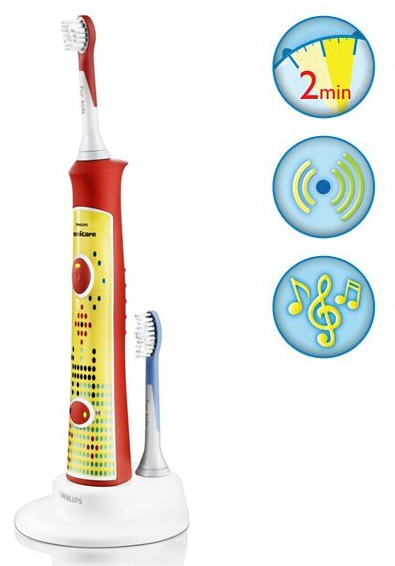 What is so great about this toothbrush is that it is designed with kids in mind. Not only does it clean there teeth it also teaches them how to. You see when they first start suing the toothbrush it has a very short timer that ends at just one minute. This time gradually increases up to the dentist recommended time of a few minutes. Its a great and easy way to get your kids to brush there teeth properly. Before you and they know it they will be brushing there teeth properly for 2-3 minutes each night and morning without any fuss at all. A huge plus is just how nice and soft the toothbrush bristles are. Those cheap kids toothbrushes you can buy in stores may have Spider-Man, Spongebob or whoever on them, but the bristles get hard as rocks after very few uses. The Philips Sonicare for kids on the other hand is a nice smooth clean for them. It could not be any easier for you kid to hold either it has a nice big rubber handle that is easy for them to hold on there own, but it also works so that you can hold it and help them brush when they are first starting to brush there teeth properly. As well as being a great toothbrush in terms of keeping your kids teeth and gums nice and healthy it is also fun. There are a wide variety of panels that you can put on there so they can change it up every once and a while. As well as this the Philips Sonicare For Kids toothbrush also makes some cool noises that help encourage them to brush all the areas. Once they have finished brushing the front for example a little tune will happen to let them know to move onto the back. There are two different settings on the toothbrush. There is a lower setting that is much more slow and gentle for kids who are aged between four to six, but there is also a stronger setting for kids who are seven and older. So as long as you replace the toothbrush heads every once in a while you can get a great deal of mileage out of the Philips Sonicare For Kids toothbrush. The Philips Sonicare For Kids is a great product. 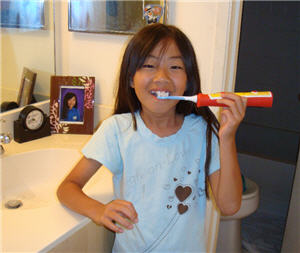 It not only will help you make sure your kids oral hygiene is perfect. But also teach them how to brush there teeth without there parents help. This entry was posted in Philips Sonicare Reviews and tagged philips sonicare review, sonicare for kids, Sonicare For Kids Toothbrush.